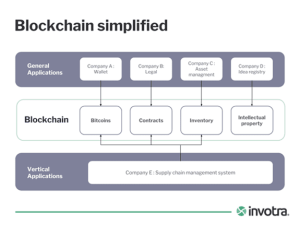 Recently lots of people have been asking me about blockchain and most people don’t seem to understand the basics. So in this blog, I just want to try and explain it in as simple a form as I can. Purists may hate this, Geeks should look away now! You can think of it as a shared database for the entire world, kinda like wikipedia is the default shared encyclopedia of the web. So once you understand this basic concept, we can start to imagine what’s possible. Conceptually this graphic shows how you can think about it, with many companies sharing information and tieing together applications. This is where people are struggling to get to grips with the potential scale, most of this confusion comes from an inherent bias towards internal applications that are controlled and managed in a way that we all understand. Now we have to expand our thinking away from the enclosed proprietary view of the world into something that ignores boundaries and where we have more certainty than we are used to having. When we all share the same data we can do amazing things that can dramatically change the way society, organisations and people work. We can chain together information to create networks of information that are all up to date and we can know with some certainty that what we are seeing is real. Blockchain is a database that is focused on things that require or can benefit, from a permanent record. Imagine if all decisions by politicians were recorded in this manner or a land registry that you didn’t have to pay a lawyer to double check for you, imagine that you can track all purchases made with your charitable donation or that you can trace the provenance of all your assets. Blockchain will bring a new level of transparency and openness to the world and help to create a truly global society, plus its really cool tech!